The economic impact of the Eagle Ford Shale in South Texas continues to climb each year, and the forecast calls for the trend to continue. The latest study focuses on sustainability for communities through the oil boom and beyond. Marked increases in employment rates were seen across South Texas in the last year for counties caught up in the oil boom. UTSA’s Dr. Tom Tunstall, who leads the Eagle Ford Shale studies, said each year’s report has shown substantial increases, and projections are strong well into the future. "Well, the outyears' numbers went up quite a bit, again because of new information. We had forecast for 2021 and 2022 roughly around $90 billion in overall economic impact by that time. But for 2023, those estimates have actually increased to about $137 billion in economic impact," Tunstall said. Communities realizing robust income from sales tax, lease funds, and secondary business increases are reinvesting in their infrastructure. Gonzales City Manager Allen Barnes says communities have to be careful to spend the newfound money wisely. "It's given us the opportunity to do the things that needed to be done for the last several decades. We have I don't know how many infrastructure projects going on. We're doing streets and sewer lines and storm drains. We have a $3.5 million project at our water plant that we're expanding," Barnes explained. Karnes City's city manager Don Tymrak says his community needs to think sustainable for the times after Eagle Ford. "There is an end. We don't know when it is, but we have people talking 40 or 50 years. Whether that occurs in my lifetime is irrelevant. The fact is, we have to think that there may be an end and what do we want to be as a city when that time arrives," Tymrak said. The study, presented at UTSA Downtown Campus Tuesday estimates, Eagle Ford generated more than $87 billion in total economic output for the state last year. South Texas is in the midst of a massive oil boom. 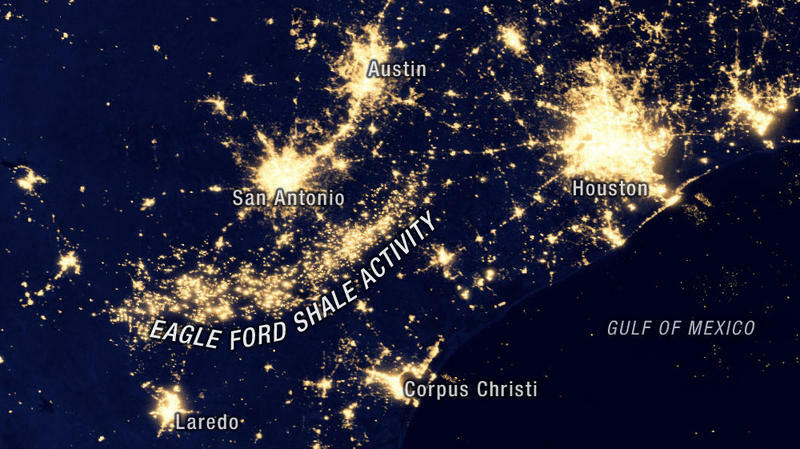 In just a few years, it has totally transformed once-sleepy communities along a crescent swoosh known as the Eagle Ford Shale formation and has brought unexpected prosperity — along with a host of new concerns. Among the towns drastically changed by the drilling is Cotulla, southwest of San Antonio, about 70 miles up from the border with Mexico. The area is called brush country — flat, dry ranch land, scrubby with mesquite and parched by drought.